The first thing to notice are the two star wheels at the bottom which are not attached to anything. These are the remains of the stopwork, designed to prevent the clock from being overwound; the other parts of the stopwork have been discarded but you can see on the plates where they have rubbed round the winding arbors. It is not uncommon for the stopwork to be removed. It seems that as the springs weaken with age the stopwork prevents the clock from being fully wound – removing it helps to keep the clock going for longer. Also missing is a rod on the left hand side which hangs from the strike lever through the eye at the lower left. This adds weight to the strike lever and helps it to return the lever into the deep slots in the count wheel. However, the extra weight may prevent the going train from raising the strike lever if the spring is weak. 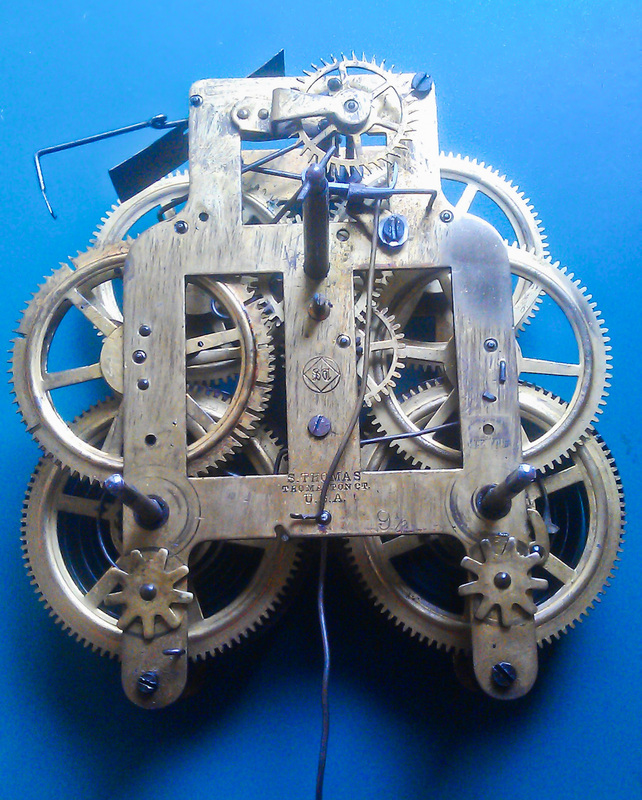 The escape wheel rotates counter-clockwise, and as the teeth point in the direction of rotation we would expect the escapement to be a deadbeat, or since this is a Seth Thomas with bent metal pallets, a semi-deadbeat. 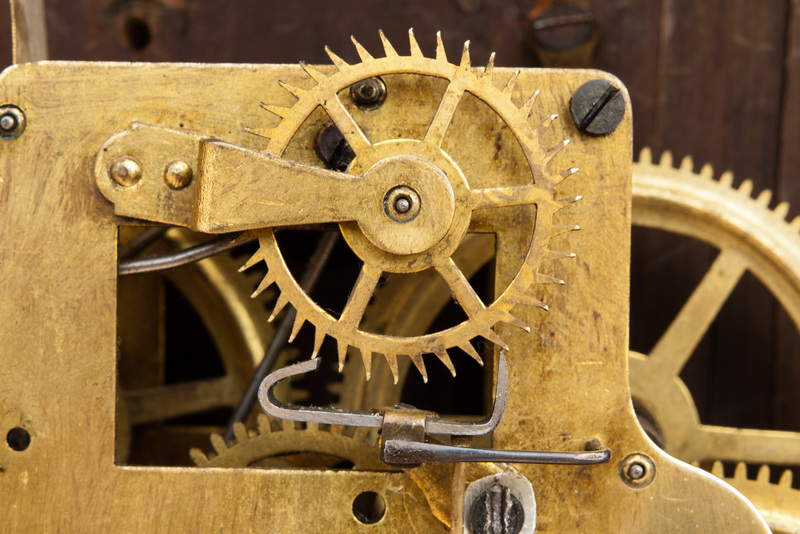 But the correct pallets would be curved at both ends – what we see here is a set of pallets for a recoil escapement, and on a recoil escape wheel the teeth point backwards. I have no idea how the clock has run for so long, but one effect has been to bend the tips of almost all the teeth on the escape wheel. One possible solution is to replace the escape wheel and pallets with a matched pair. Recoil escapements of the correct type are available for a modest cost from M & P. I’m also seeking the views of members of the NAWCC discussion forum on the best way to proceed.